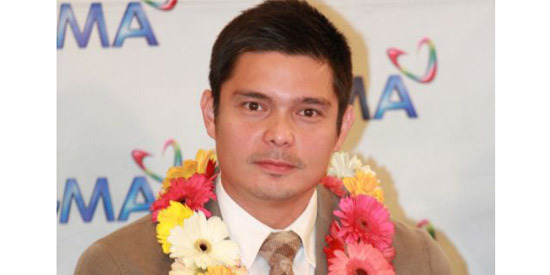 "Kapuso Primetime King Dingdong Dantes remains a full-fledged Kapuso as he inked an exclusive five-year contract with GMA Network, Inc. The contract signing was held today at the Manila Polo Club and attended by the top officers of the Network. "Present in the contract signing were GMA Chairman and Chief Executive Officer Atty. Felipe L. Gozon, GMA President and Chief Operating Officer Gilberto R. Duavit, Jr., GMA Executive Vice President and Chief Financial Officer Felipe S. Yalong, GMA Films President Atty. Annette Gozon-Abrogar, GMA Entertainment TV's Officer-in-Charge Lilybeth G. Rasonable, GMA Vice President for Program Management Jose Mari Abacan, GMA Vice President for Program Support Department Regie C. Bautista, GMA Vice President for Drama Productions Redgie Acuña-Magno, GMA Assistant Vice President for Alternative Productions Gigi Santiago-Lara, GMA Assistant Vice President for Corporate Communications Angela Javier-Cruz, Program Manager for ETV Drama Redgynn Alba and Dingdong's manager Perry Lansigan. "The award-winning actor is currently taping Genesis, the network's primetime drama slated to premiere on October 7 on GMA Telebabad. "Dingdong is recognized as one of the country's top celebrity endorsers, a much-admired youth advocate and one of the most accomplished TV and movie actors of his generation. Dingdong started his career in GMA's top-rating youth-oriented series T.G.I.S. in 1995 and since then, he was given various projects that honed and developed his craft as an actor, host and versatile performer. "Rasonable said that the network will continue to provide good projects for Dingdong that will further his career and stature in the showbiz industry and will keep on supporting his endeavors and advocacies.